The 2009 J.D. Power Initial Quality Survey is out. 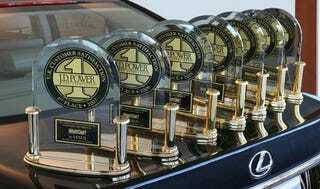 Lexus takes top marks followed by Porsche, Cadillac, Hyundai and Honda. The worst? Land Rover, Smart, And Mini. J.D. Power And Associates ranks brands by the number of problems per 100 cars sold. The industry average is 108 problems per 100 vehicles (PP100), down from 118 the previous year. The best performers were Lexus (84 PP100), Porshce (90 PP100), Cadillac (91 PP100), Hyundai (95 PP100) and Honda (99 PP100). Domestic automakers Ford, Chevy and Mercury were all above the industry average, with Chrysler way down near the bottom at 136 PP100. The worst performance came from Mini, with a whopping 165 PP100. Full results below. WESTLAKE VILLAGE, Calif.: 22 June 2009 - New vehicles sold by Chrysler, Ford and GM's domestic brands have improved in initial quality by an average of 10 percent, compared with 2008, surpassing the 8-percent rate of improvement by the industry overall, according to the J.D. Power and Associates 2009 Initial Quality StudySM (IQS) released today. Overall, the industry average for initial quality is 108 problems per 100 vehicles (PP100) in 2009, down from 118 PP100 in 2008. Initial quality for domestic brands has improved to an average of 112 PP100 in 2009 from 124 PP100 in 2008. Lower PP100 scores indicate a lower rate of problem incidences and higher quality. "Even in the face of unprecedented challenges, the Detroit automakers are keeping their focus on designing and building high-quality vehicles, which is a precondition for long-term success," said David Sargent, vice president of automotive research at J.D. Power and Associates. "High quality generally translates into reduced re-engineering costs and lower warranty expenses during a vehicle's life cycle. High quality also enhances an automaker's reputation for reliability, which is a critical purchase consideration for many consumers." In addition to the marked improvement by domestic automakers, many import brands continued to perform well in 2009. Lexus leads the overall nameplate rankings, averaging 84 PP100. Following in the rankings are Porsche, Cadillac (which moves from 10th rank position in 2008 to third in 2009), Hyundai (improves from 13th rank position in 2008 to fourth in 2009) and Honda, rounding out the top five. Suzuki posts the largest improvement in ranking, moving from 32nd place in 2008 to ninth in 2009. The study finds that initial quality for newly launched and redesigned models in 2009 has improved compared with previous years. Historically, all-new models have typically launched with below-average levels of initial quality. However, several all-new models in 2009, including the Hyundai Genesis, Kia Borrego, Toyota Venza and Volkswagen CC, perform considerably better than their respective segment averages. Many redesigned models in 2009 also show notable improvement from the previous generation-particularly the Acura TL, Ford F-150, Honda Pilot and Nissan Z. "Achieving high levels of initial quality in all-new models is one of the greatest challenges for manufacturers," said Sargent. "Now that more manufacturers are getting their launch quality right straight out of the gate, consumers can expect the quality of new vehicles to continue to rise." The Initial Quality Study serves as the industry benchmark for new-vehicle quality measured at 90 days of ownership. The study is used extensively by manufacturers worldwide to help them design and build better vehicles and by consumers to help them in their vehicle purchase decisions. Initial quality has been shown over the years to be an excellent predictor of long-term durability, which can significantly impact consumer purchase decisions. The study captures problems experienced by owners in two distinct categories-design-related problems and defects and malfunctions.